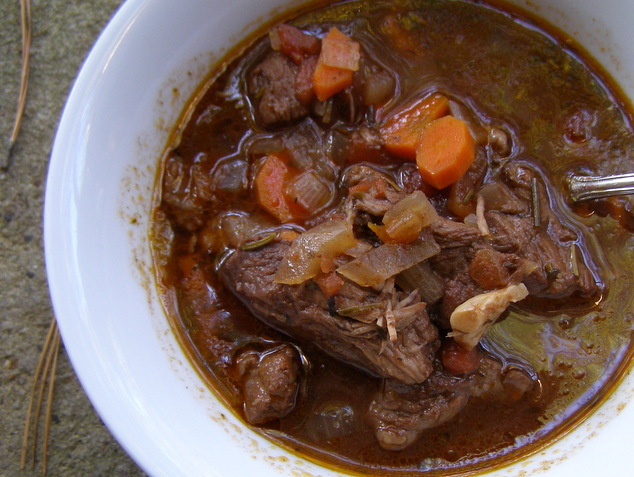 The following beef stew recipe is a family favorite, and is perfect for colder months. It’s an altered version of this Cooking Light beef daube recipe. I’ll admit: I like this dish without loving it. Other people always seem to enjoy it more than me. It’s tasty, don’t get me wrong, and the meat comes out incredibly tender, but the flavor isn’t as rich or complex as I want. So I’ve also included potential improvements in the Notes section, and will try them and post an update. 1. Heat olive oil in a Dutch oven over low heat. Add garlic; cook 5 minutes, stirring occasionally. Remove garlic with a slotted spoon, and set aside. 2. Increase heat to medium-high. Season cut beef with salt and pepper. Add beef to pan; be sure to cook in batches to avoid overcrowding. Turn meat frequently to brown on all sides. Remove browned beef from pan & set aside. 3. Add wine to pan; bring to a boil, scraping pan to loosen browned bits. Add garlic, beef, and the remaining ingredients, plus salt & pepper to taste. Bring to a boil. 4. Place beef mixture in a slow cooker. Cover & cook on high for 5 hours. Remove bay leaf before serving; serve with French bread, mashed potatoes, or egg noodles. By far the most time-consuming & difficult task is cutting and trimming the chuck roast. Here’s a video showing you how; I’d budget at least 35 minutes for it. That said, don’t buy precut stew meat! It’s inferior quality meat to begin with, costs more, and meat surfaces degrade quickly once exposed to oxygen. Go very light on the cloves. A “dash” means just that; I’ve overdone the cloves before, and regretted it. Use a decent red wine. Burgundy is traditional. Consider adding any or all of the following: mushrooms, potatoes, and corn starch or flour at the end to thicken the sauce. Also consider substituting baby carrots for the chopped carrots, and dusting the beef lightly with flour before browning. Finally, you might lightly brown half a pack of bacon (cut into 1 inch strips), and use the resulting fat to then brown the beef (the browned bacon also goes in the stew). I do this for boeuf bourguignon, and it adds a lot of flavor.